We specialize in boutique quality personalized can and bottle coolers for all occasions. They are so fun!! Design your own or design one for a friend -- you are only limited by your imagination. Can coolers, also known as coolies, huggies, huggers, etc, are the perfect way to dress up your beverages while keeping them cool at the same time. All of our coolers are collapsible, so they are easy to store and easy to carry with you in your purse, bag or pocket. Design one for yourself or that special someone today! Hello, and welcome to my website. My name is Bobbi Jo Price and I started Lily Lane Embroidery over 6 years ago. I love what I do! I really enjoy creating special, personalized items for my customers and I have a great team of people here that help me get your orders out in a timely fashion. Each person on my team takes great pride in their work so I know you will love your personalized coolers. 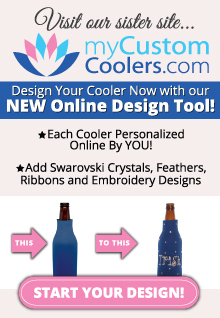 We have sold over 20,000 custom coolers to date!!! I hope you enjoy your shopping experience. If you are looking for anything in particular that I do not have on my site, just ask. There are so many things that we can do with your special coolers, and I'd be happy to discuss any design preferences with you before, during or after you've made your purchase.